The retina is the tissue that lines the inside of the eyeball. Its mission (or function) is to capture light and to send the images to the brain via the optic nerve. The center of the retina is called the macula. It is a very important and sensitive area. The macula is responsible for the ability recognize faces, see movement and fine details, and ultimately for our sharp central vision. 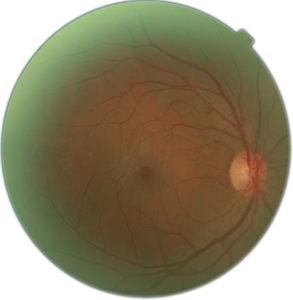 In an examination of the fundus we can assess the condition of the macula but we can also study the vessels of the retina and optic nerve head. Also known as age-related macular degeneration (AMD) – it is an age-related disease that affects the center of the macula. Almost 10% of the general population shows signs in the fundus. It usually occurs after age 50, but its prevalence increases with age, exceeding 20% in populations aged 70 years or more. AMD is the number one cause of severe vision loss and legal blindness in adults over 65 in Europe. Because AMD can be completely asymptomatic in early stages it sometimes becomes diagnosed too late and treatment is not as effective. EThe best known and frequent finding of macular degeneration is the presence of drusen. Drusen are deposits of waste material that the eye is unable to metabolize. These deposits accumulate under the retina and lead to damage of the macula. 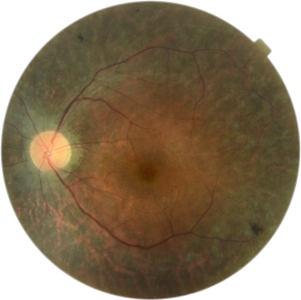 For its complete diagnosis it is essential to use optical coherence tomography (OCT) and often also angiography. 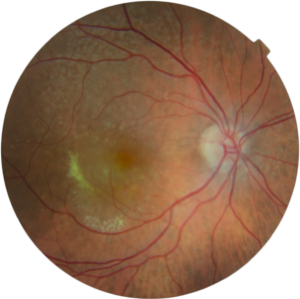 exudative or wet AMD: new abnormal blood vessels grow under or even within the retina, a choroidal neovascularization forms, and blood or fluid leaks under or into the retina. It can lead to severe vision loss . dry or atrophic AMD: there is cell loss and retinal atrophy. Dry AMD can cause great loss of vision but it progresses slowly over time. Early diagnosis is crucial for preventing large vision loss. In patients with early or intermediate forms antioxidants are recommended to slow down the progression. Self-examination with the Amsler grid is a quick and simple test to monitor any changes of vision. It is recommended that people with macular degeneration test their eyes with the Amsler grid several times a week. Exudative forms are very serious and are usually treated with injection of drugs into the eye to close vascular lesions. The main factor for the success of treatment and obtaining good vision is early diagnosis of the disease. If the disease is diagnosed after a long onset vision cannot recover despite treatment with injections. The main drugs used in the treatment of wet macular degeneration are Anti-VEGF medications: Lucentis, Avastin and Eylea. There is no treatment for atrophic or dry AMD, the use of antioxidants is recommended. Currently, they are some ongoing clinical trials to slow the progression of the dry form. In Europe, 10% of the population suffers from diabetes mellitus, and 50% of these patients show signs of retinal involvement. Today, diabetic retinopathy is the leading cause of blindness in young patients in industrialized countries. Early stages of the disease usually have no symptoms. But also later stages can be symptomless for a long time. Some cases are diagnosed too late and treatment is not as effective. • seeing spots or floaters. Diabetic retinopathy is an eye disease that damages the blood vessels in the retina. They leak blood and other fluids that cause swelling of retinal tissue and blurred vision. The most common findings are dilation of capillaries (microaneurysms), intraretinal hemorrhages, lipid exudates and neovascularization. 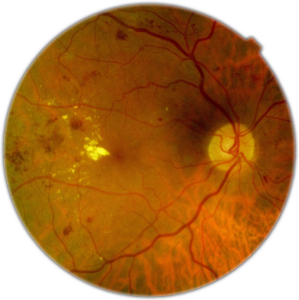 Sometimes, further diagnostic tests (fluorescein angiography and optical coherence tomography (OCT)) are required for correct staging of the disease. • non-proliferative retinopathy: The small blood vessels in the retina become damaged and can leak fluid into the retinal tissue. This stage is divided into mild, moderate and severe forms. • proliferative retinopathy: Newly formed abnormal blood vessels develop on the surface of the retina. These are very fragile and tend to bleed which can lead to severe vision loss and even blindness. These vessels proliferate, bleed, change into scar tissue, and can detach the retina. These forms of retinal detachment pose unique challenges for a retinal surgeon. To prevent retinal damages of the disease is essential to keep the blood sugar and blood pressure under good control. Regular retinal check-ups are recommended so that treatment can be induced in a timely manner. Early treatment improves the prognosis and can avoid severe vision loss in a high percentage of patients. The most effective treatment if new blood vessels have been formed is pan-retinal photocoagulation. This laser surgery is also performed in cases with severe non-proliferative retinopathy. It is able to prevent the growth of new vessels. 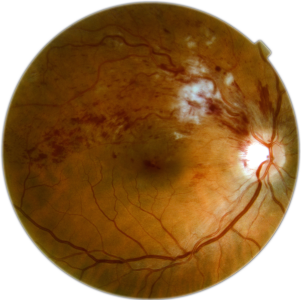 The most common cause of visual loss in diabetic patients is the presence of macular edema. 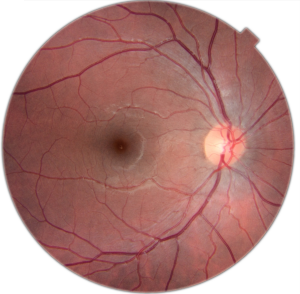 This is caused by fluid leak of damaged blood vessels in the area that serves central vision (macula). There are several treatments for macular edema such as laser, intravitreal injections of anti-VEGF agents (Lucentis, Eylea, Avastin) and cortisone release devices (Ozurdex). Central serous chorioretinopathy is one of the most common causes of vision loss in young patients. It affects the macula and is characterized by fluid leakage underneath the retina. It can lead to a serous detachment or blister beneath the retina. The exact cause is not known, but it typically affects young males and is often associated with stress and the use of cortisone. Central serous chorioretinopathy usually causes a distorted or blurry vision usually in one eye, although it can occur in both eyes. Patients report a gray spot in the center of vision, unexplained flashed of light, impaired color vision. Objects seem to be different in size if compared to the unaffected eye. A fluid accumulation in form of a blister is visible at the macula usually without other pathological findings. Optical coherence tomography (OCT) is usually performed to diagnose central serous chorioretinopathy. In chronic forms angiography might be useful. In patients with previous episodes we recommend avoiding (as far as possible) stress and the use of cortisone. It usually is a benign condition that resolves by itself within days or weeks. In chronic forms, lasers or modified laser (PDT) can be applied. It is one of the most drastic cause of visual loss. There are different causes but the most common is the presence of a hole or tear in the retina. By age the vitreous (jello-like substance that fills the eye) liquefies and moves frequently. This movement can cause tractions, holes tears in the retina. Through these retinal breaks liquefied vitreous passes under the retina separating it from the eye wall. In the vitreous floaters appear as curly lines or dark spots that move with the eye. The traction of the retina produces flashes or intense light reflections. In myopic patients, in patients with a family history of retinal detachment or in patients who have already had a detachment in one eye, we recommend regular review of the peripheral retina with dilated pupils. There are injuries that may predispose to retinal breaks and sometimes can be strengthened by laser. Treatment of retinal detachment is usually surgical. There are various techniques depending on the type of detachment. The classic technique is characterized by belts or placing parts on the surface of the eye to relax and seal holes. Current techniques substitute the vitreous with gas followed by laser treatment. Epiretinal membrane describes a layer of abnormal tissue on the surface of the central retina or macula. The cause is usually not known, though the risk factors are the presence of holes in the retina or laser treatment of the retina. For most people with epiretinal membrane the progression is very slow. It produces a gradual, painless loss of vision. In many cases distortion of letter develops, straight lines can be wavy. Treatment is usually surgical and decided according to the visual acuity and the symptoms the patient describes. It is one of the most frequent procedures in retinal surgery. A choroidal nevus is a mole which is located in the choroid (layer under the retina). It is usually asymptomatic and does not create any problem. Like skin moles choroidal nevi should be monitored periodically to make sure they do not change. In rare cases, similar to skin moles they can convert into melanomas. Vascular disorders of the retina are another major cause of impaired vision. 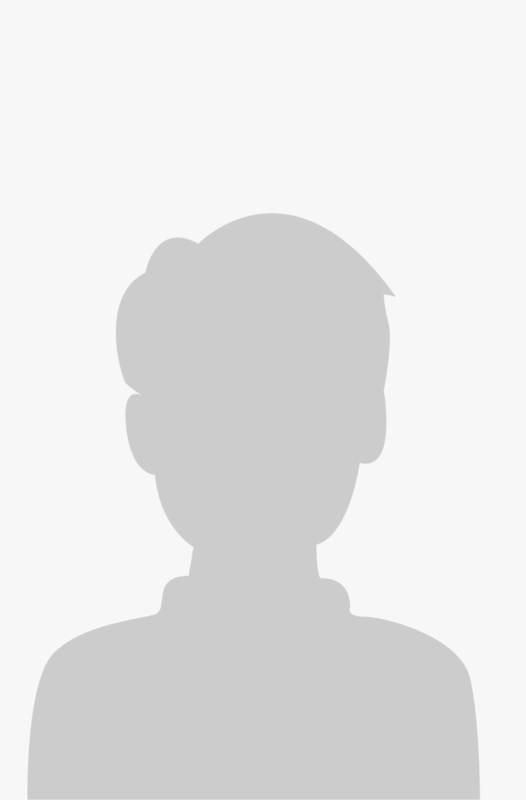 These are characterized by sudden loss of vision. The loss may affect the complete visual field or only parts. • occlusion of a retinal artery: mostly related to embolic phenomenon. It is mandatory to rule out lesions in the heart or arteries of the neck. 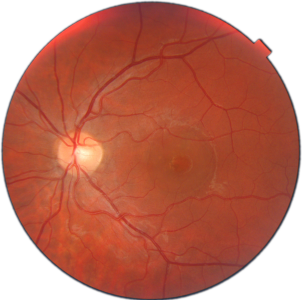 • central retinal vein occlusion: may also be related to hypertension or certain blood disorders. • Ischemic optic neuropathy: caused by obstruction of blood flow to the optic nerve. This disease is associated with cardiovascular risk factors. Retinal dystrophies are usually bilateral diseases that affect both eyes. They are chronic and progressive disorders. They are present at birth but may come forward later in life. 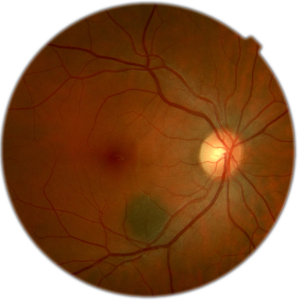 Retinal dystrophies are often diagnosed in the second or third decade of life. 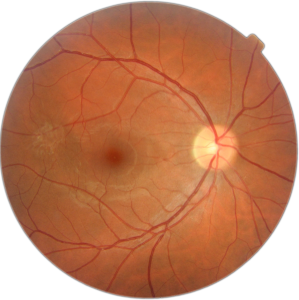 Retinal dystrophies are characterized by a “premature wear” or atrophy of retinal cells. They may affect the central retina (macula), the peripheral retina or the entire retina. The retinal dystrophies usually have a significant genetic component. If present it is recommended assessing immediate family members. 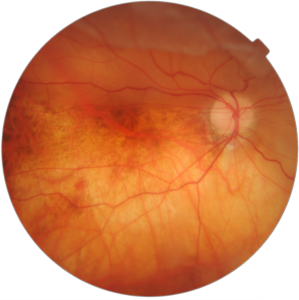 The most common retinal dystrophy is retinitis pigmentosa. A macular hole is characterized by the presence of a hole in the macula. Its etiology is unknown, although in younger patients is often associated with trauma. Patients have decreased central visual acuity that can be accompanied by distortion of objects. Treatment is usually surgical, although drugs have recently shown to successfully treat a macular hole in early stage of the disease (Jetrea).